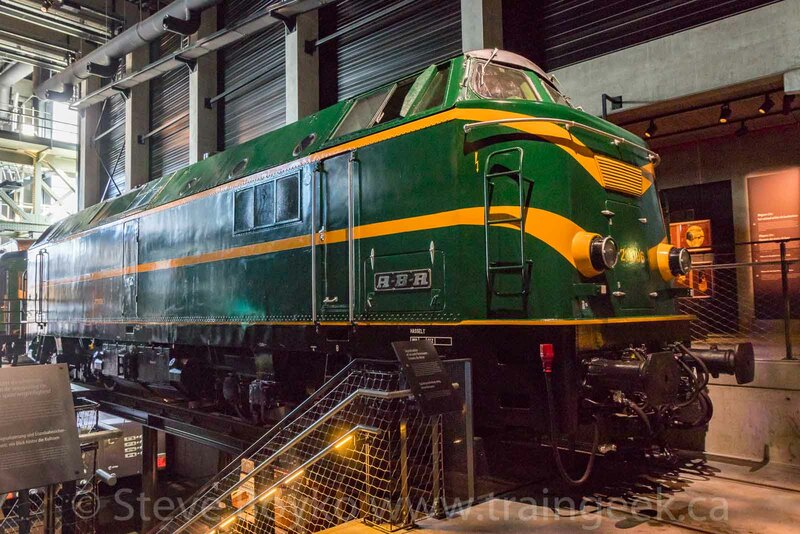 In February I visited Train World outside Brussels. 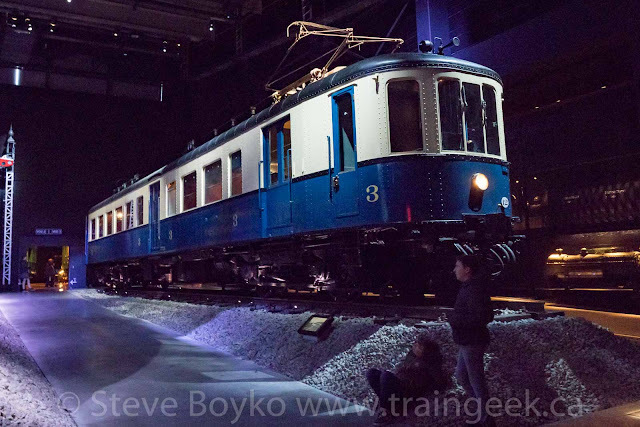 This is a new museum dedicated to the history of trains in Belgium. 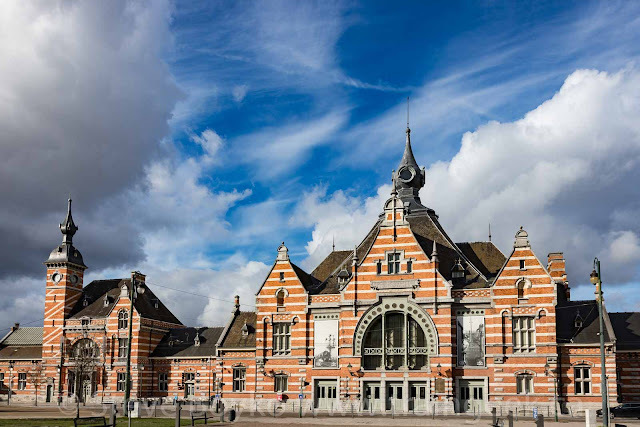 It is located in the grand old train station in the municipality of Schaerbeek in the Brussels capital region. 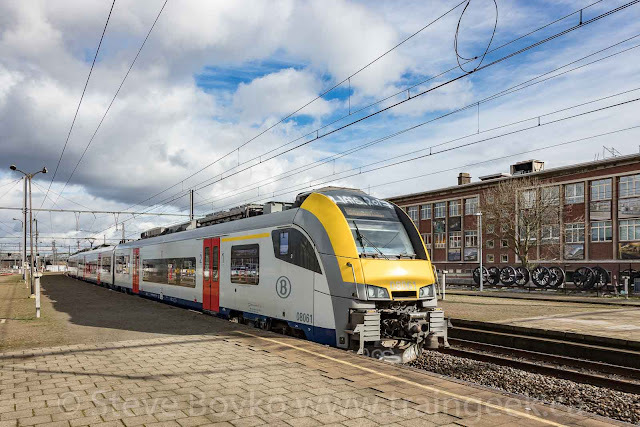 To get there, I took this train from the Brussels Centraal station to Schaerbeek - another Siemens Desiro ML trainset. Another train zoomed past while I was on the station platform. It's a busy spot, as you'll see later. I walked over to the museum building by going down the stairs to the tunnel under the platforms. In Belgium it is quite common to have a tunnel under the platforms so people can switch platforms without crossing tracks, as it would be very dangerous to cross the tracks and it is strictly forbidden. 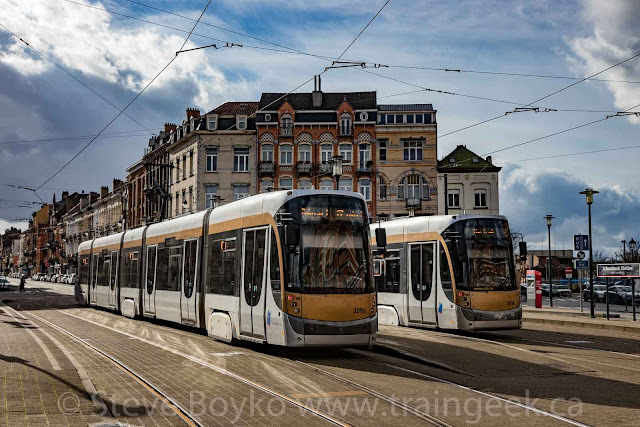 Schaerbeek is a tram stop and there were plenty of trams around. These are Bombardier T3000 "Cityrunner" Flexity Outlook vehicles. Each of these 5 segment vehicles can seat 54 people (total capacity 184) and can reach a maximum speed of 70 km/hr, although I think that's unlikely in normal use. Two of these vehicles were loaned to Vancouver during the 2010 Olympics for use on the Vancouver Downtown Historic Railway. 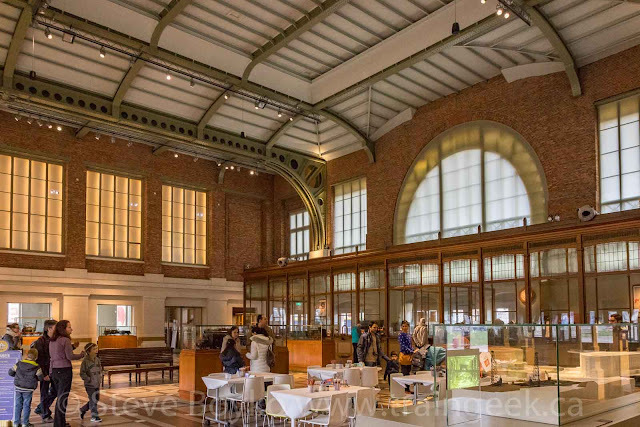 The interior of the station is large and airy, filled with freestanding model cases and some art areas for kids. The models include early Belgian locomotives and train stations. Along the back is a large enclosed area - probably an old ticket counter - that contains various collections including ticket punches, railway uniforms, and even old computers. That was interesting, but frankly I was getting a little disappointed that this was all there was. I had expected more. I followed a few other people out the back door and found myself behind the station, where there was an old passenger car and a steam crane / "stoomkraan" / "grue a vapeur" named Juliette. The builder's plate said it was made by the Craven Brothers in Manchester, England in 1912 and was a 35 ton crane. 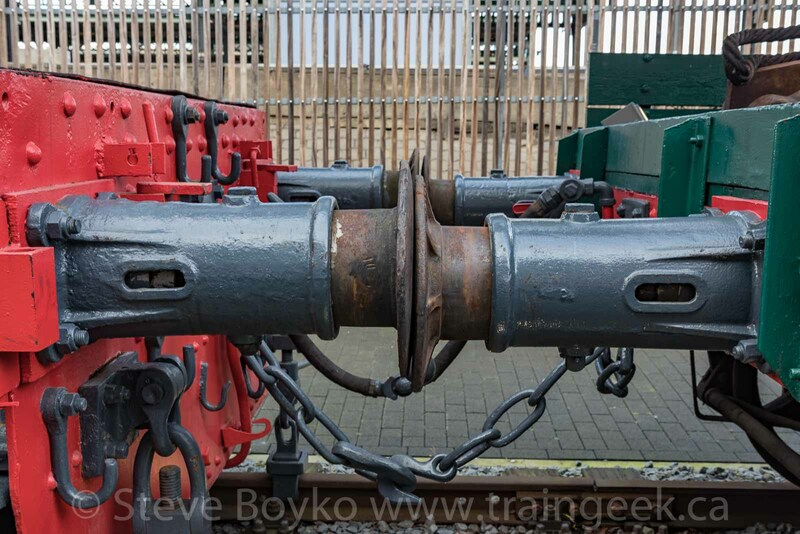 Those European couplers and buffers are so different than the North American version. OK, so there was more than I initially saw! This was good. 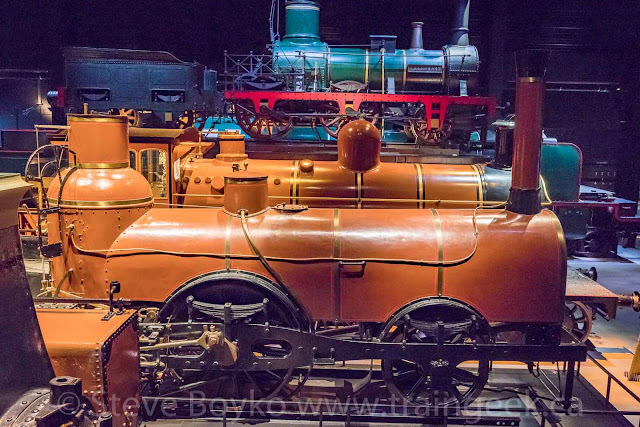 These were early Belgian steam engines, from 1844 through 1905. Note the one closest to the camera has no cab at all; the engineer stood on a platform behind the boiler. That must have been exciting! Type 51 steam engine, 1880. 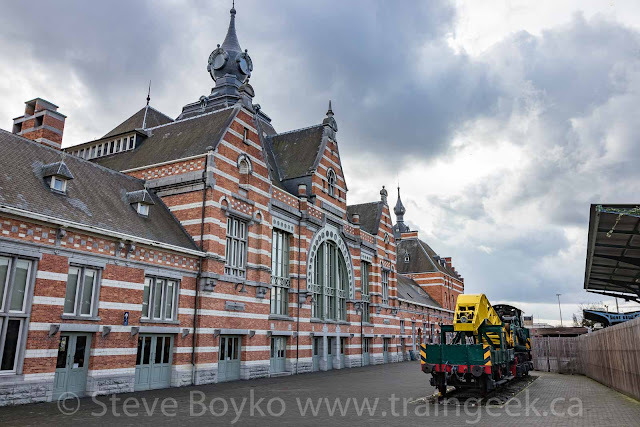 How about a little detour into the history of railways in Belgium? Sure! The Belgian state was involved in railway development very early on, right after the Belgian Revolution in 1830 where Belgium split from the Netherlands. 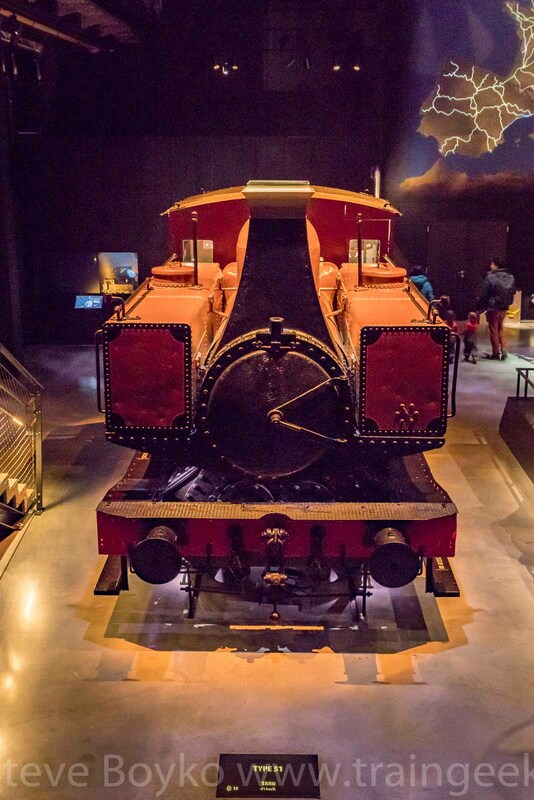 The first steam passenger railway in continental Europe was built between Mons and Antwerp (through Brussels) in 1835. A Liège-Ostend followed. Several private railways did spring up afterward, but by 1912, 94% of the railway mileage in Belgium was owned by the state. By 1958 Belgian railways were fully owned by the state. 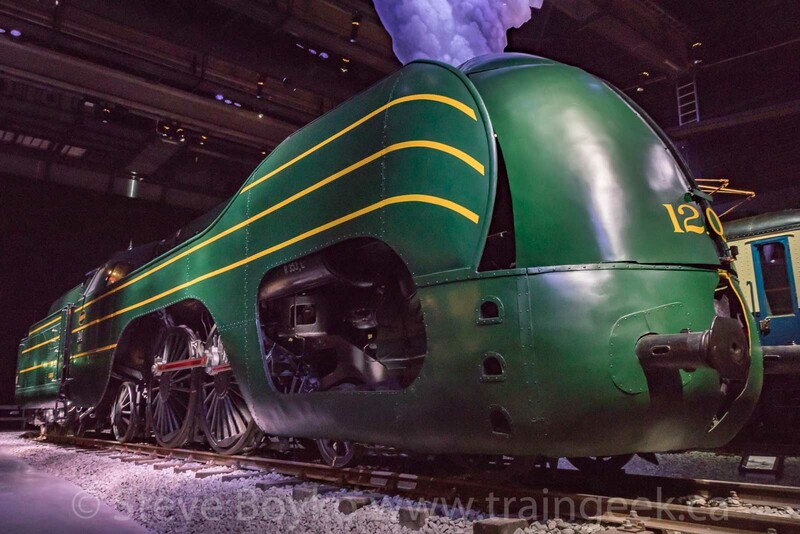 Steam locomotives and railway design was initially heavily influenced by British designs. Belgium operated with steam power for many years, until electrification of the lines began in 1935. Today the vast majority of Belgian railway mileage is electrified, with diesel-electric locomotives operating as switchers in yards and powering maintenance trains. Here's an overhead photo that I took on my way out. One of the nice things about this museum is that you get overhead views of most of the collection. After the first steam engine gallery, I walked through a display of railway clocks and a room with a "grab bag" of railway signals, signs and other miscellaneous railway items. 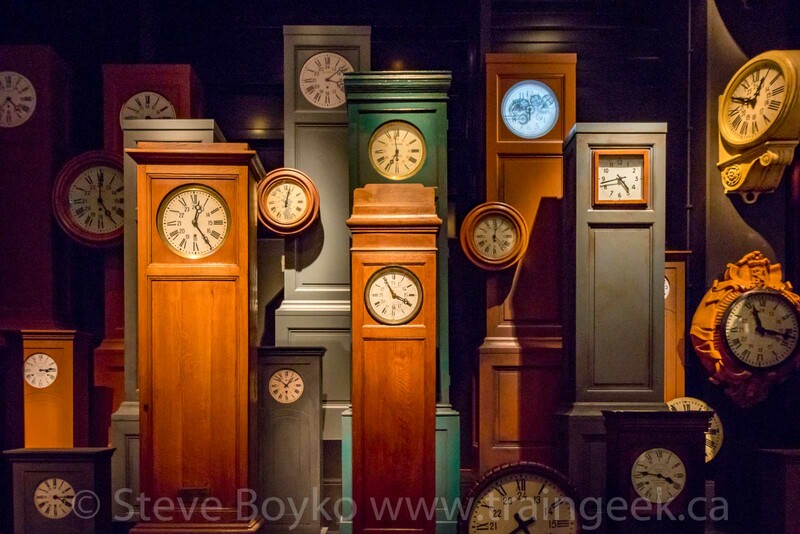 I liked the clocks a lot. The second large gallery contained several early self-propelled passenger cars, and this impressive green steam engine. 12004 is an SNCB Type 12 locomotive, built for fast boat trains between Brussels and Ostend. They were inspired by the Canadian Pacific Railway 4-4-4 "Jubilee" locomotives and were fully streamlined, except for openings to access valve gear and other items. These locomotives were capable of speeds up to 140 km/hr (87 MPH) and must have been quite a sight speeding along the rails. The "Thomas and Friends" locomotive "Axel" is based on this type of locomotive. There were a few early passenger cars here, as well as a mail / express car. 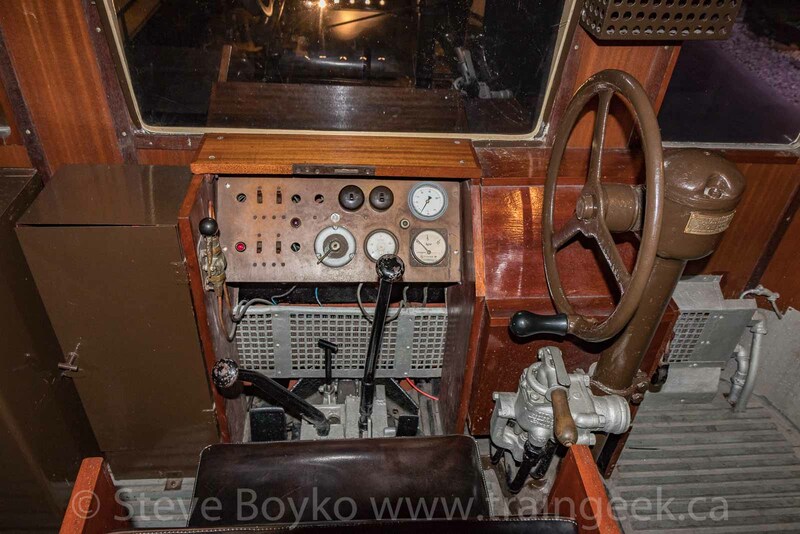 Check out the interior of this self-propelled car. The seats look beautiful but probably weren't all that comfortable! The controls for this vehicle don't seem to be very complicated. Not a lot of controls on this vehicle! I liked this electric tram. I think it's a "Motorwagen Type 551"
The next (and final) gallery contained several relatively modern pieces of railway rolling stock. I really liked this series 64 locomotive. You could go into the spartan cab and look around, and also walk underneath the locomotive to see it from below. One thing I didn't realize is that the engineer sits on the left side of the cab. In North America, the engineer sits on the right side, and the conductor sits on the left. Before you ask, Belgians drive on the same side of the road as we do in North America. 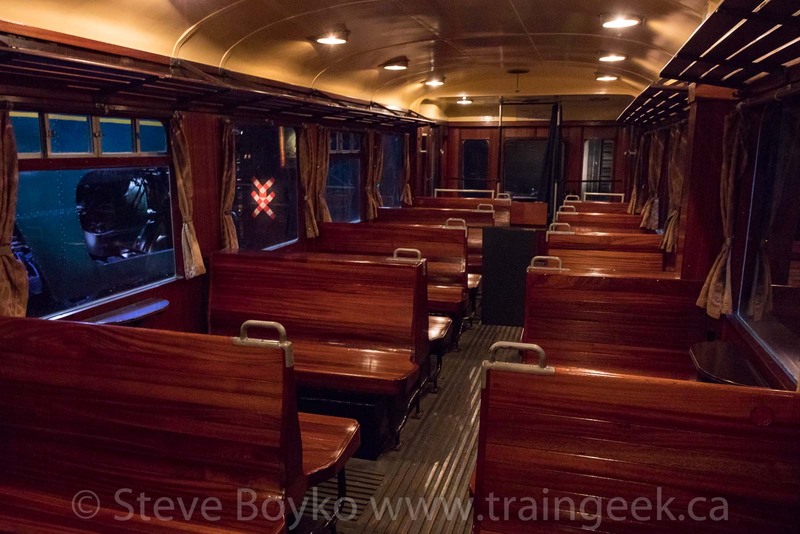 The above photo shows the view from the cab of the locomotive. 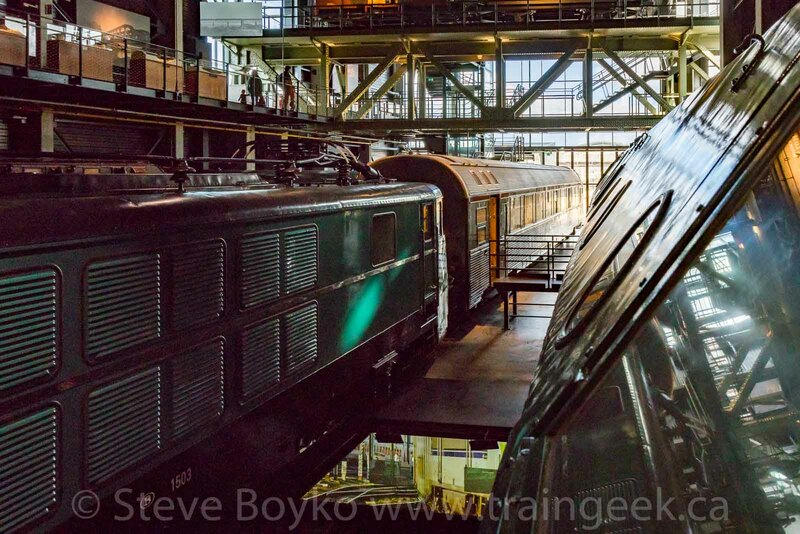 There are several passenger cars and another locomotive in the same gallery. There's another level above with various displays and nice views of the equipment from overhead. This gallery has direct track access to outside. The sign said this is a "Lorrie Type 7" / "Draisine Type 7" from 1949, capable of 40 km/hr. The word "Draisine" is used to refer to auxiliary human or engine powered machines used to transport rail workers. In North America these would include velocipedes, hand cars, and speeders. 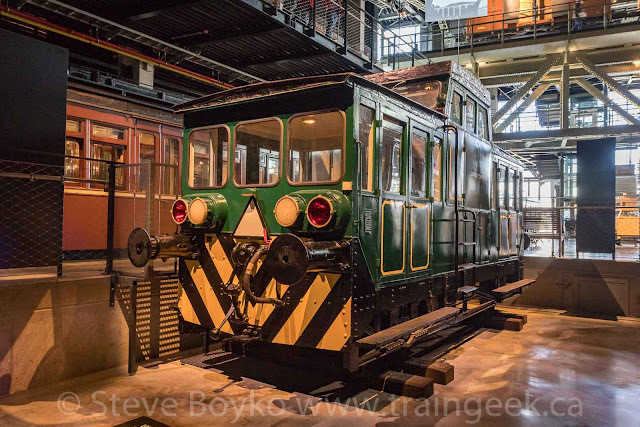 This little guy looks like a caboose - with a lot of windows - but it has its own engine. There's even a model on Shapeways for this. As I mentioned, there are several passenger cars in this gallery. 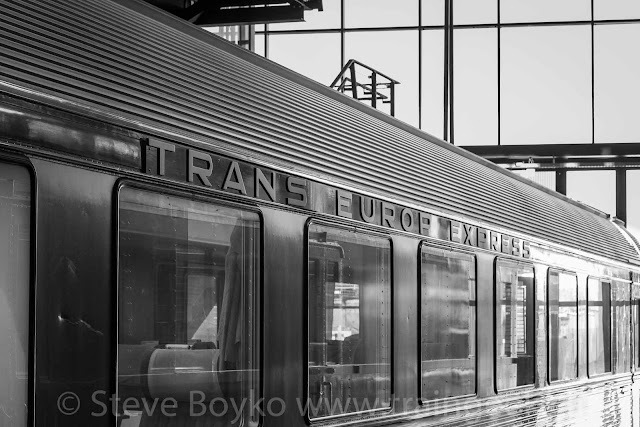 One is from the Trans Europ Express (TEE) (not Trans-Europe Express, the song by electronic music pioneers Kraftwerk). This was a first-class train service that covered most of Europe in the 1960s and 1970s, before being replaced by more localized train that also offered second-class service. There's a Canadian connection here, as a couple of former TEE trainsets came to North America in the early 1980s. Eric Gagnon has some information here. 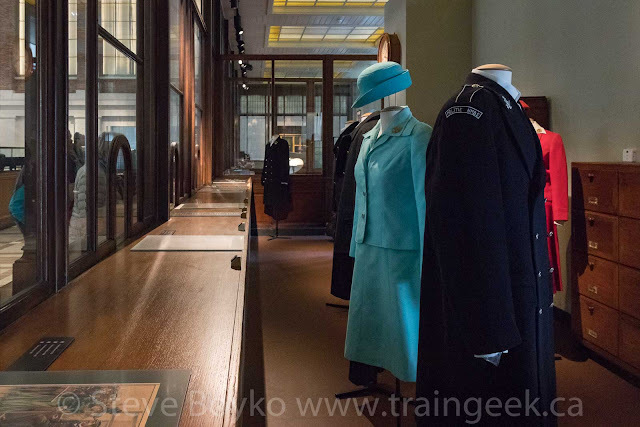 Also in this gallery are two royal carriages. I peeked in the windows and they look very nice inside, but they are not open for tourists. Hopefully they will be opened up at some point! At the end of this gallery, visitors climb up a few levels to an overhead walkway that takes them back through all the exhibits, from above. Great views abound! 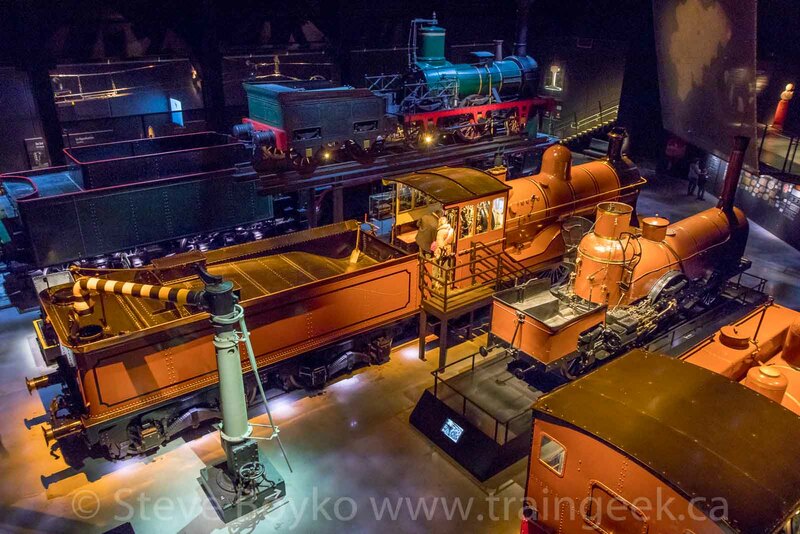 Along the way, there is a train simulator! I would have liked to have tried it but there were a few families using it, so I kept going. 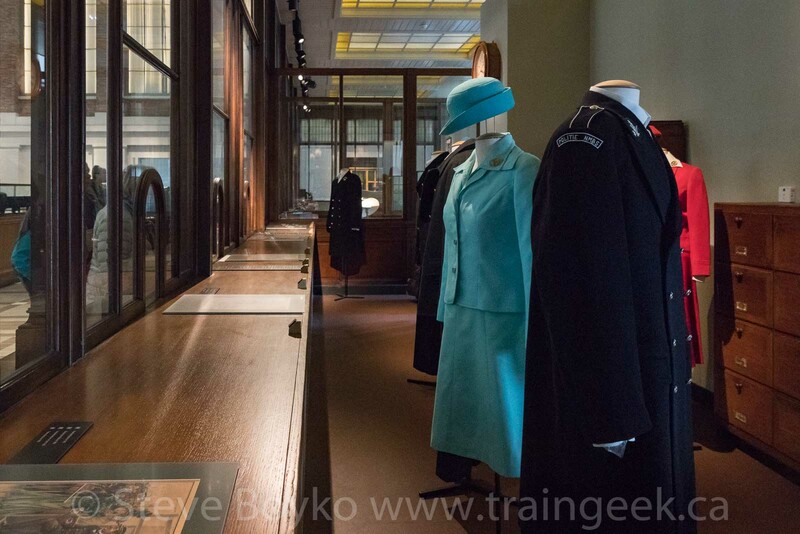 There is a gift shop at the end of the museum, featuring the usual collection of train toys and books. Here the books were in Dutch or French, so they were of limited use to me! I didn't buy anything. 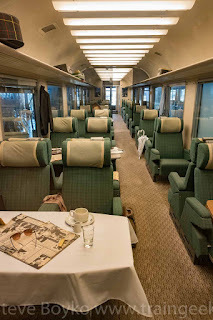 I really enjoyed my visit there and I'd recommend it to anyone who is interested in trains. It's also a great destination for families to spend a couple of hours exploring. Once I wrapped up, I went to the train platform to catch my train back to the Centraal station in Brussels. Alas, I missed my train, so I had to spend most of an hour waiting... which was great for railfanning! That's in my next post.